It’s hard to classify Hundreds as a game, per say. Developed by Semi Secret Software, this $5 universal app for the iPhone, iPad, and iPod touch feels more like a post-modern art installation, or perhaps a Cold War torture device maliciously released on iOS. Regardless, Hundreds is one of the singular weirdest experiences you’ll find on the iOS platform—and its beauty is certainly in the eye of the individual player. The name Hundreds draws from the number of levels of the game (100) and the object of the game: to achieve 100 points on a given level. The game’s ambient noise and lack of formal tutorial will perhaps dissuade the more casual of players, and the game’s quickly-ramping difficulty will frustrate all but the most dedicated (and masochistic) of puzzle enthusiasts. Hundreds starts off simple enough: you press and hold down on the gray circle in the middle of your screen to turn it red and expand its size. The circle starts with a value of zero, but as it grows, its value increases. Once it hits 100, you win the round. 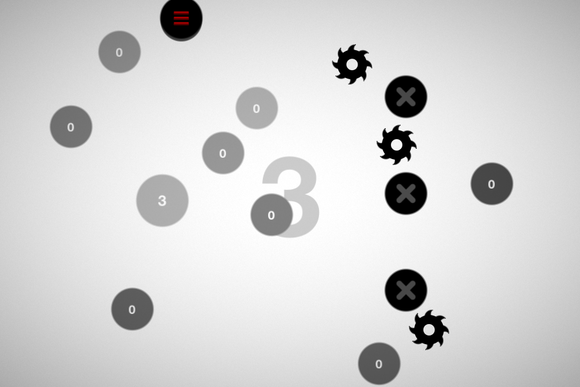 Steer clear of other circles and obstacles while expanding. The trick, as you’ll soon find in later levels, is that as you press down on the circle to increase its circumference, if it touches any other obstacle while increasing (and red), you lose. So as more circles appear in later levels, the goal is to frantically grow them when they’re safely distant from other objects. You don’t need to get any one circle to one hundred, but the cumulative number (displayed in the center of the screen) needs to reach that value before you can move on. Touch anything while red, and you're dead. This is much harder than it sounds. Later levels include obstacles like spinning razor blades that can zero your circle, moveable stoppers, bubbles, and dozens of other circles. 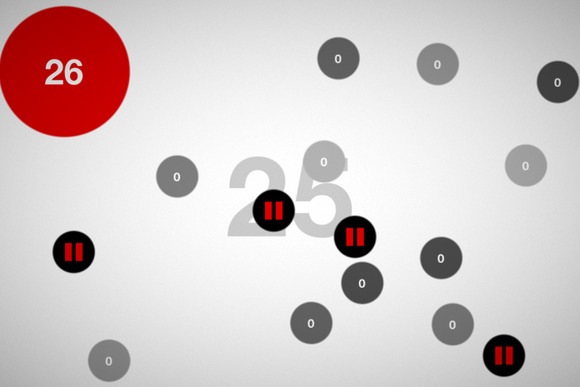 Some levels require you to tap on two circles at the same time in order to grow either of them while dodging obstacles. To succeed in Hundreds, you’ll ultimately need both insanely good reflexes and a great strategy—a rare combination in puzzle games. 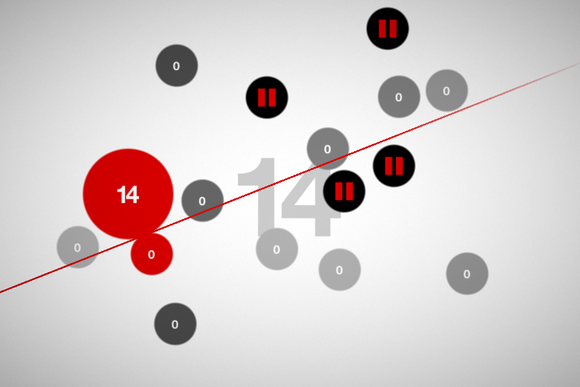 Don’t be fooled by the game’s minimalist approach to color and art (the game is nothing but a series of shapes and shades of gray, black, and red); Hundreds is finely tuned to aggravate you. Dangerous obstacles are in store in later levels. This does not always work to its advantage. While successful puzzlers hold your hand through a simplistic tutorial and then mask the game’s core fundamentals behind adorable art and pleasing visuals, Hundreds never really feels like a progression or an accomplishment. The main menu is so bare bones it doesn’t even have a “play” button. The soundtrack feels like something out of a bad dystopian sci-fi movie, which is either nerdishly charming or immediately mutable, depending on your perspective. Each level appears simple and yet becomes a personal torture chamber as you panic at every circle’s bounce and every potential touch. Even if you manage to beat several levels, the most you can hope for is an ominous, jumbled message from the developers. When the message is finally un-jumbled, it’s an equally infuriating riddle or Zen-like saying. But Hundreds isn’t bringing you Zen—it’s bringing you misery. Hundreds is one of those games that is exceptionally hard to review because it’s a Rorschach test for the user. Do you enjoy exceptionally challenging games that don’t hold your hand, give you little pay off, and are so artistically barren that “unremarkable” would be an artistic upgrade? Then Hundreds might be your black-turtleneck-wearing, “this-is-the-time-on-Sprockets-where-we-dance-esque” masochistic game of the year. But for the majority of users, you’ll find the frustration offset by little reward, the gameplay difficult but never approaching fun, and the entire experience more of a chore than a form of entertainment. To succeed in Hundreds, you’ll ultimately need both insanely good reflexes and a great strategy.